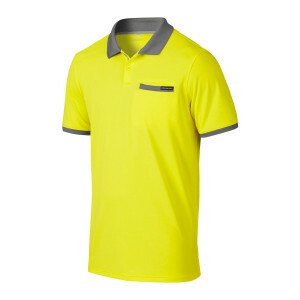 Designed with a tailored fit and sweat-wicking fabric, the Oakley Bubba Watson Myers Polo offers the modern comfort and easy functionality made popular by Bubba. Contrast sleeve hems, a fold-over collar and welt pocket create vintage appeal and small-item storage. This golf Myers Polo features a wordmark logo patch on the chest pocket and bark logo at the upper back that stand out for Oakley pride. Play by your own set of rules in this cool and comfortable Myers Polo.